If someone dropped you here blindfolded, then said to open your eyes, you would probably think you were on some alien planet. It is a strange landscape. 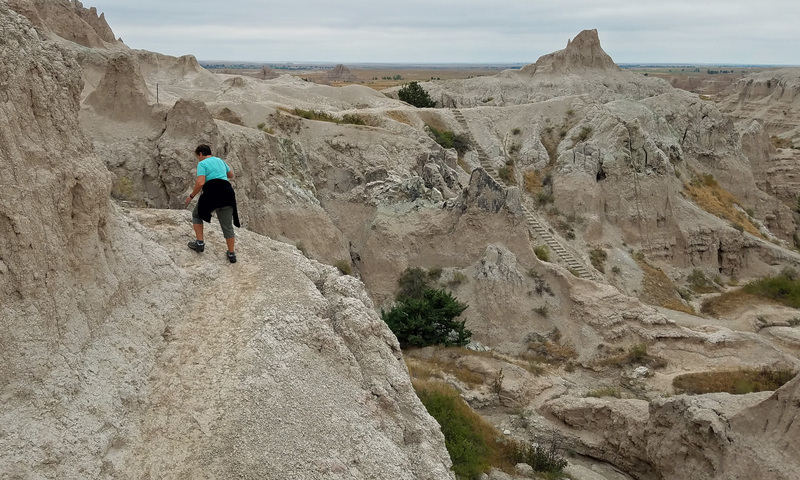 What the Lakota Indians called mako sica and early pioneers just called the bad lands, can be a wonderful experience for today’s adventurers. After all, we don’t actually have to guide our horses and provisions down steep slopes and rocky ravines, we simply have to follow the scenic loop road through the park. 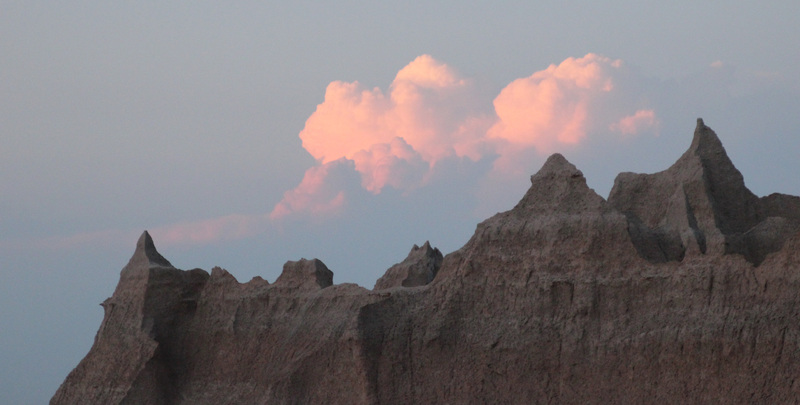 We arrived in Badlands National Park after leaving Mitchell and the famous Corn Palace. On the banks of the Missouri River we stopped at the Lewis and Clark Interpretive Center to learn about their trip up the Missouri River for President Jefferson. 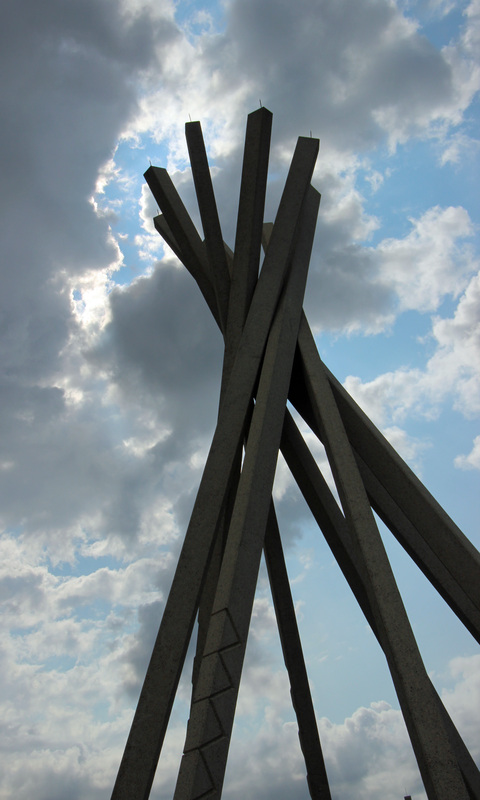 Also on the banks of the river was the tribute statue Dignity. There was a definite change in the landscape as we moved further west across the grasslands and prairies, with crops of sunflowers, millet, and flax and less corn. Spotted a small herd of pronghorn along the way. As we drove into the park, we began to see the wall, an eroded landscape of rock and silt that is the edge between a northern prairie of higher elevation and a much lower prairie leading to the White River (aptly named due to the light color of the sediment it contains). All of it used to be an ancient seabed, so the layers of silt, sand and ash are subjected to wind and water erosion, leaving behind a landscape that looks like giant sandcastles. It’s hard to believe it doesn’t just collapse on itself, but with only 16 inches of rainfall a year, these hills have baked into a hard rock known as popcorn rock. Our campground is below the wall in the area called Cedar Pass. We have the backdrop of scraggy brown peaks behind us and flat open prairie in front of us. What a sight! 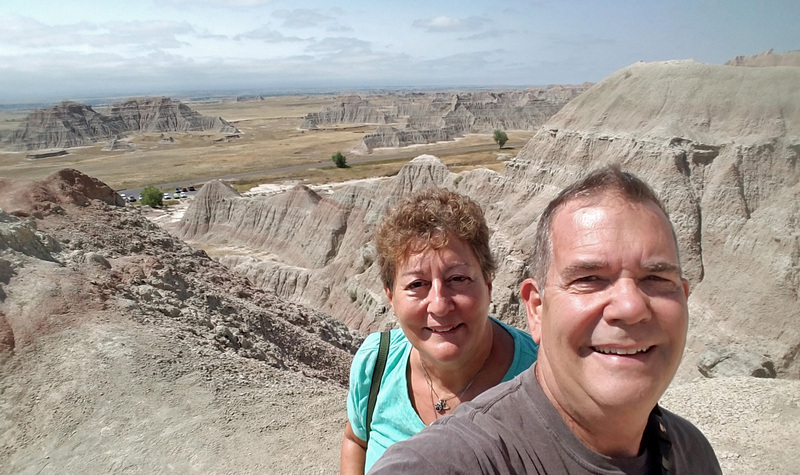 Before the day was done, we hiked some short trails to view the landscape and took the longer stairway trail along one face of the wall at Cedar Pass. Back in camp we had a nice breeze and were glad the temperature dropped from the low 90s to 65 or less. We relaxed with a few adult beverages, grilled the last of the fresh corn from Minnesota and tucked in under the covers. Next day was an early start, thanks to Kodi. As we move west, now in the mountain time zone, he seems to wake closer to 5 am. Argh. But it gave us time to get ready for more hiking – besides, a bank of fog rolled in and we had a light drizzle to start the day. Great hiking weather to try two trails before it got too hot and sunny. The Notch Trail is a mile and a half round trip across the sandy rock ledges to get a view of the White River valley from behind Cedar Pass. 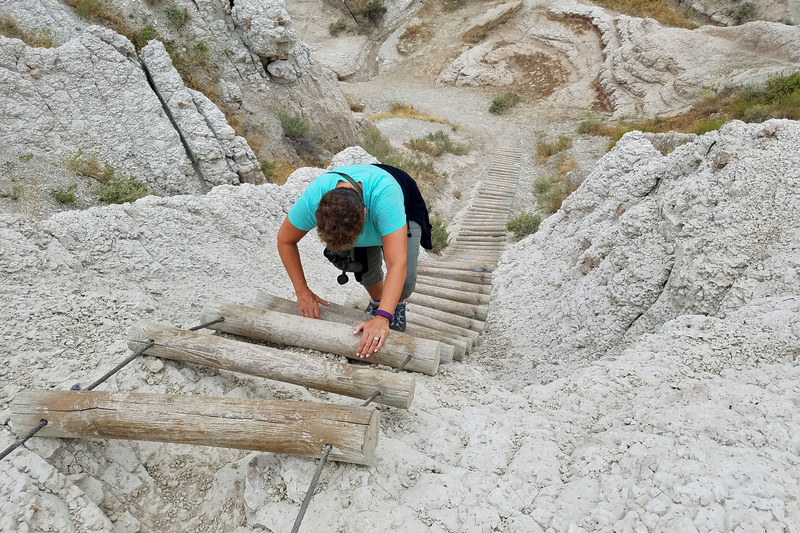 It involves a trail ladder of sorts that is a one-at-a-time ascent or descent. 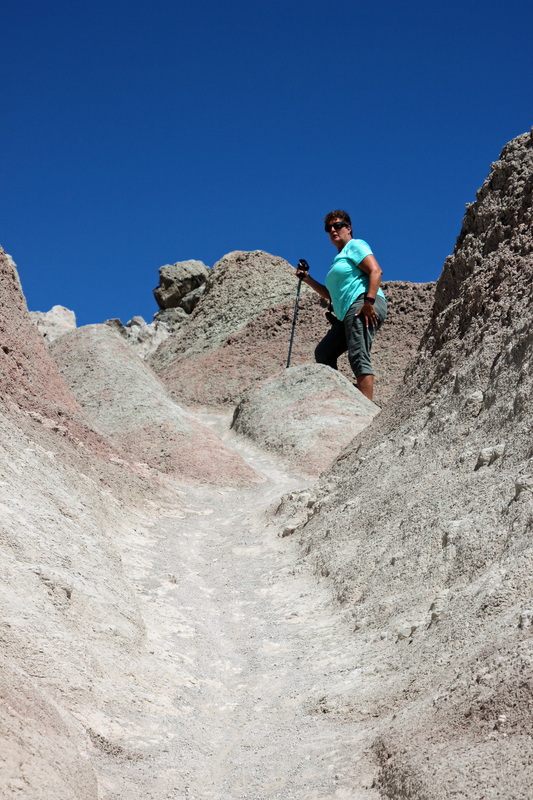 Some narrow edges and steep slopes made it a tricky hike at times, but it was truly a strange landscape. Reminded both of us of Arches NP and Zion NP. Driving west on the loop a bit further we stopped for the Saddle Pass Trail. This one was half as long, but much steeper and one with lots of loose sand and gravel underfoot. But the view and the challenge were definitely worth it. Down from our climb we continued west on the loop road through the jagged landscape. We spotted another herd of pronghorn and two large groups of bighorn sheep. 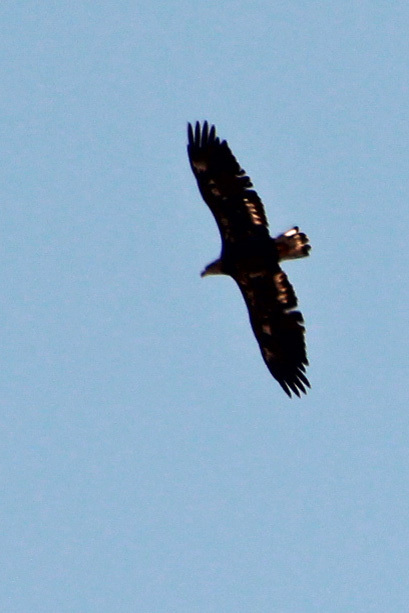 Also caught a golden eagle circling overhead. 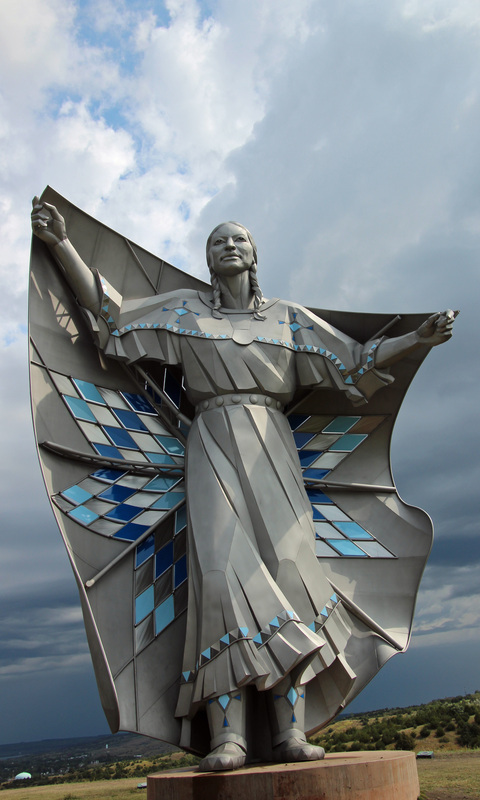 The photo isn’t as crisp as I would like, but it sure does evoke the paintings of thunderbirds by the Native Americans. 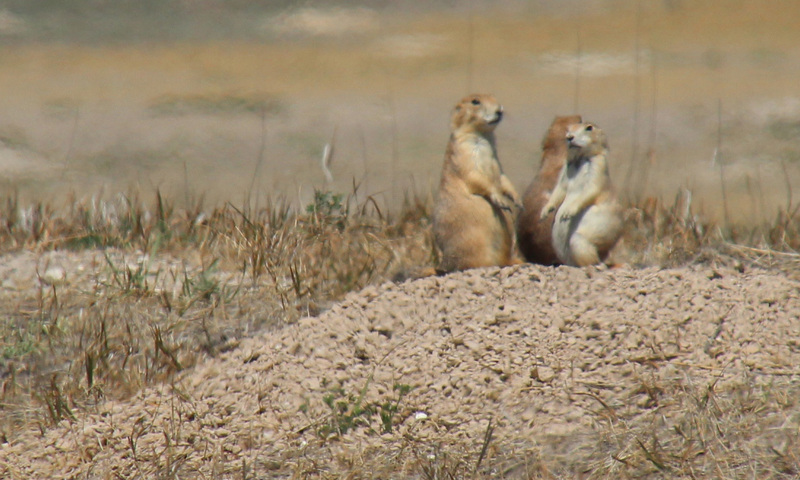 Probably the most entertaining were the several prairie dog villages we saw. At first you thought you were looking at large ant mounds in the grass, but soon noticed the critters pop out of their holes and whistle out a warning. Off they went to gather grasses and bring them back to the den, tails upright as they ran. 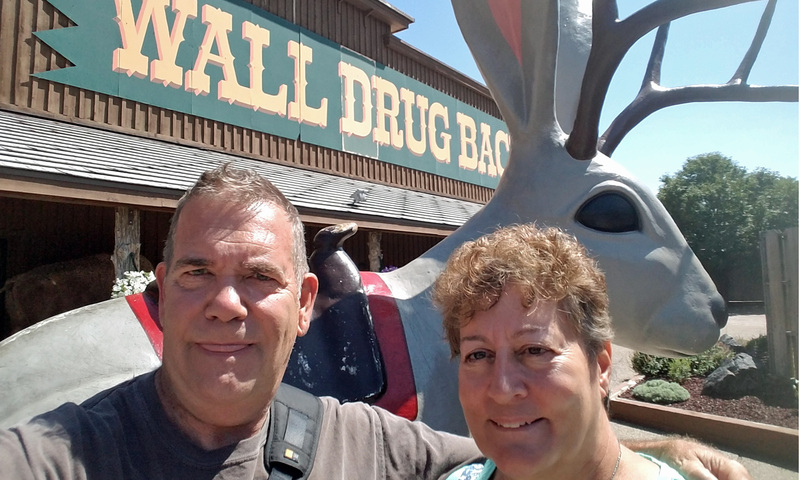 Last stop before camp was in Wall, the home of the famous Wall Drug Store. Probably has twice the roadside signs than Rock City. Kind of a strange collection of western wear, Native American art, souvenirs and whatnot. Of course, this is where you find the jackalope, stuffed and mounted for you to take home. But we only bought some of the recommended maple-glazed donuts that certainly did taste awesome. Across the street was the Badlands Bar, with cold beer on tap calling out to us. I had a local brew with a Brunch Burger. Lesson learned here: a fried egg on a juicy burger with onions, hashbrowns and cheese sounds like a good idea, but it is waaaay too drippy. The beer helped, though. Dinner tonight might just be PB&J. 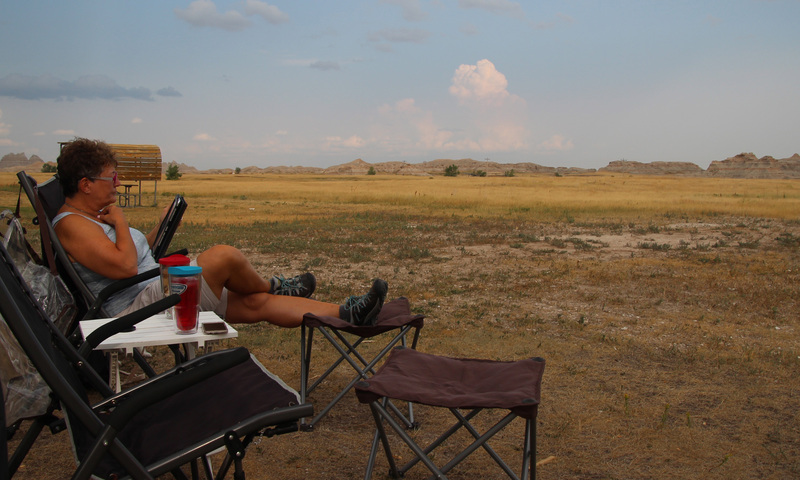 Tomorrow we strike camp and head to nearby Custer State Park for more wildlife sightings and exploring as the adventure continues. . .
Love reading your posts! The hiking looked a little dangerous to me, but you guys are veterans at this hiking business! Keep having fun! Doing our best. Recent stories had to wait for us to get back on the grid. Posted Black Hills, too. Awesome trip! Pictures are great. You should have Jackie take a few of you hiking. She agreed. Will try. So much to photograph and then sort through.